I didn’t even get a lot of good pictures. 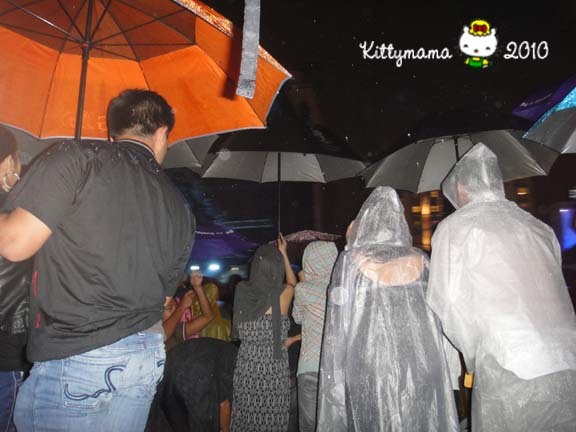 were not going to be daunted and would brave the downpour, face flashfloods, and navigate through horrible traffic just to make it that night. 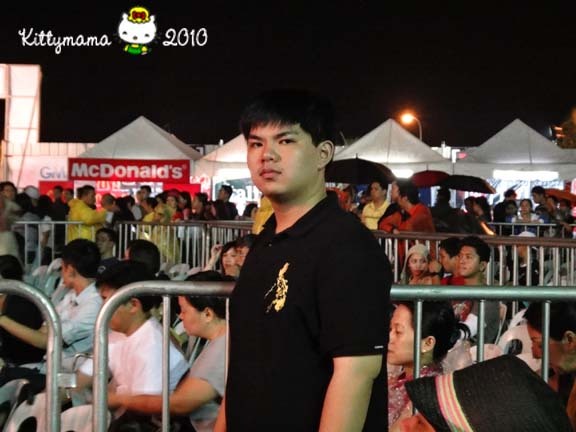 (Before the rains came again) Alex not happy to watch this cool concert with, urgh, parents! If I was buoyant and optimistic during the daytime that night would provide some respite from the rain, I was terribly wrong. By six and already en route to the venue, the rains poured madly and traffic crawled at a snail’s pace. There were times when water lashed the windshield so angrily and lapped at our vehicle’s side so strongly that I was overwhelmed with Ondoy pananoia. 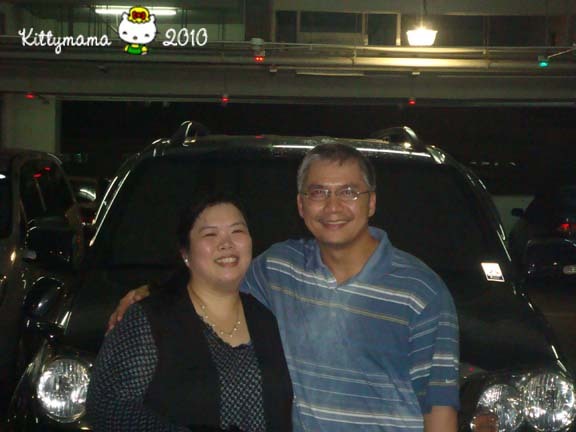 Still, we made good time, thanks to A’s impressive knowledge of Metro Manila’s convoluted streets, arriving at SM Mall of Asia just a little before the show started. We wanted to catch the show in its entirety, including Aiza Seguerra’s front act, but hunger and throbbing headaches won over our love for Aiza’s music. We headed over to SuperBowl for a meal, gobbled everything, and ran all the way back to the venue as fast as our distended bellies would allow us. By then, the drizzles had started again, slowly increasing in intensity and duration. The umbrellas went up. I was angry at myself for not insisting on raincoats for all of us. Among the three of us, all we had for protection was a shawl, a large golf umbrella, and a baseball cap. I was also quite peeved that the concert was not moved indoors or that arrangements were not made to cover the place even in some portions. All the seats were dripping wet. We exhausted my tissue supply to wipe them down reasonably dry. Worse, the plastic chairs were tied down to one another (I understand the reasons why they tie down the seats, but really!) and it was quite a feat to move them around without disturbing our neighbors’ seats. 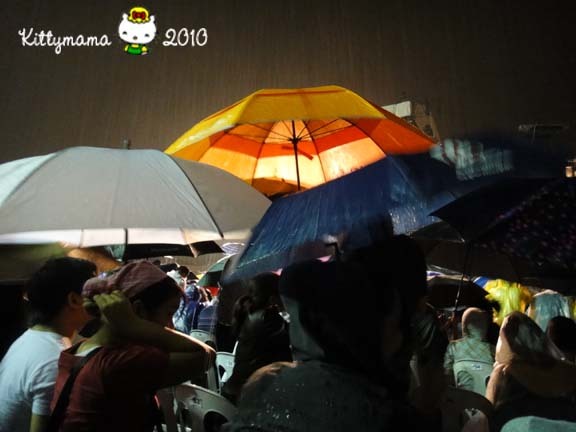 Moving around in cramped aisles was also horribly difficult, what with huge umbrellas that can poke and put out eyes. 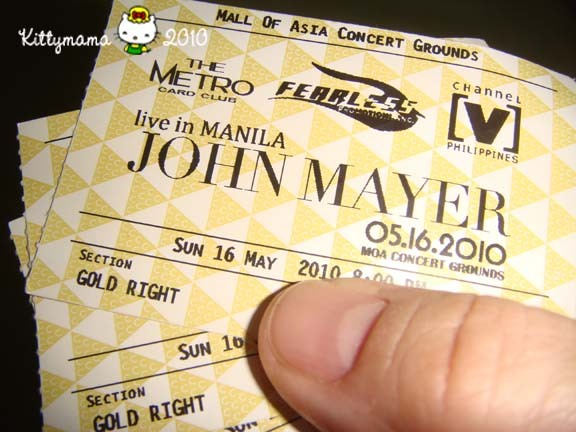 I am listening to John Mayer on iTunes right now, warm and safe in the comfort of my room. I am also nursing a rather bad cold today. Still, last night was worth it, if only for this one perfect picture. Oops, wrong picture, teehee! You have to admit, though, that A and I looked cute, even when wet and chilled to the bone. 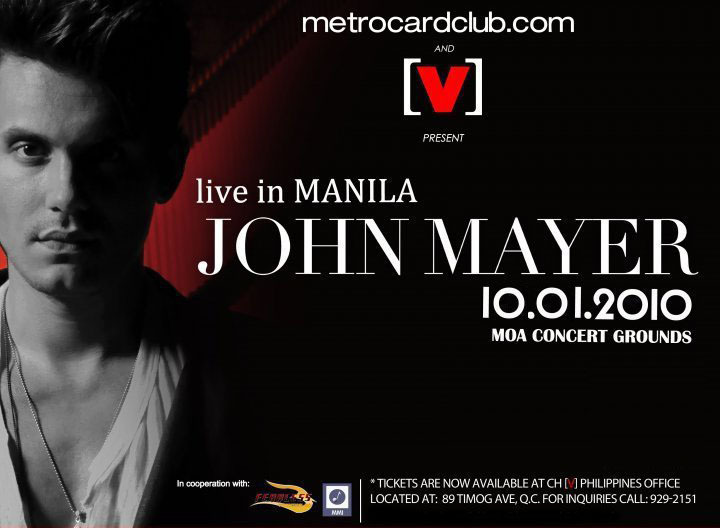 I hope he comes back to Manila. But please, not when it rains. 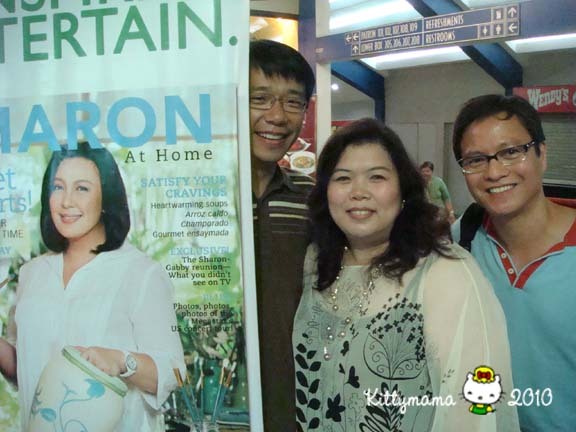 Just a day after watching CATS, my husband and I were to stay up past our bedtime again, this time, with the much anticipated return of my favorite Filipino singer/actress Sharon Cuneta on stage. Okay, I admit it, I am a fan, a big one. I never miss any of her live shows, I have doubles of her albums (one for collecting, the other for listening) and her albums are always on constant rotation in our music systems (aka forced listening), much to the dismay of my Paramore-enamored seventeen-year-old son. I suppose that it is this die-hard mentality that has convinced my better half that the way to my heart is always through- tadah!- highly prized tickets to her shows. 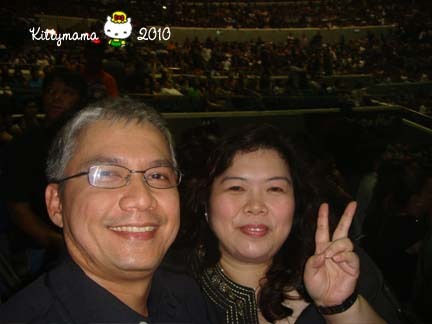 Thus, August 7, Saturday night, found us at Araneta Coliseum, waiting for Ms. Cu neta’s appearance on stage. 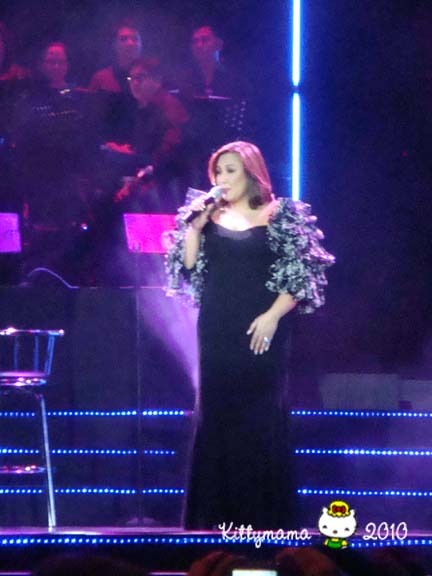 At a little past nine, after an hour or so of waiting, the lights dimmed and show opened with a resplendent Ms. Cuneta singing “Kahit Maputi Na Ang Buhok Ko,” a Rey Valera composition Ms. Cuneta popularized early in her career. Even now, it is difficult to fault the original recording done more than thirty years ago. Yet, Ms. Cuneta seems to perform this song better with each repetition, imbuing it with a beguiling lack of pretension about the stardom that has changed her life forever. Apt that she chose to open the show with this, a song that reminds us many years after she set foot in that recording studio as a twelve-year-old, that this life is still her dream. From there, it was a veritable OPM (Original Pilipino Music) feast, from songs of the Apo Hiking Society (ahh, I miss them, I do), to Jukebox selections of Mae Rivera and Imelda Papin, to the classics of Maestro Ryan Cayabyab, to melodies of inspiration and fervor, and to the ballads that her fans have grown to love as her personal anthems (“To Love Again,” “Bituing Walang Ningning,” “Maging Sino Ka Man”). Each segment was a drama on its own, with songs that reflected the different emotions and experiences of all her years in showbusiness. 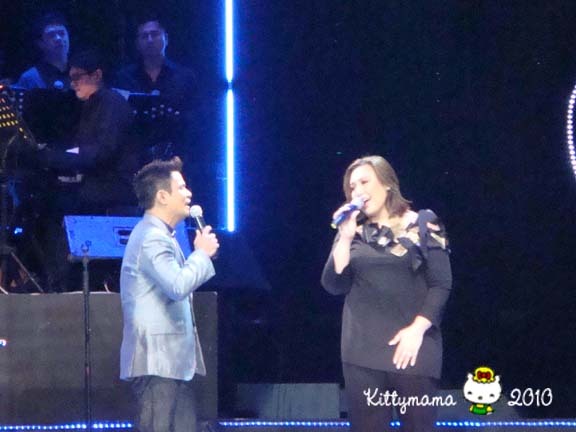 Piolo Pascual, seemingly unfazed by the intrigues of the past weeks (if you’re not much of a showbiz follower, just google Piolo + KC, haha) bravely shared centerstage with the Mega Star, their duet a mash-up of “Himala” and “Imposible.” Kuh Ledesma and Zsazsa Padilla sang the best songs of the night with Ms. Cuneta, a medley of Mr. Cayabyab’s “Ang Ating Musika,” “Kahit Ikaý Panaginip Lang,” and “Minsan Ang Minahal ay Ako.” For me, this medley’s arrangement is the most memorable of the night, highlighting these singers’ particular strengths (Ms. Ledesma’s clarity, Ms. Padilla’s high notes, and Ms. Cuneta’s honesty*) and bringing out the best of their voices together. 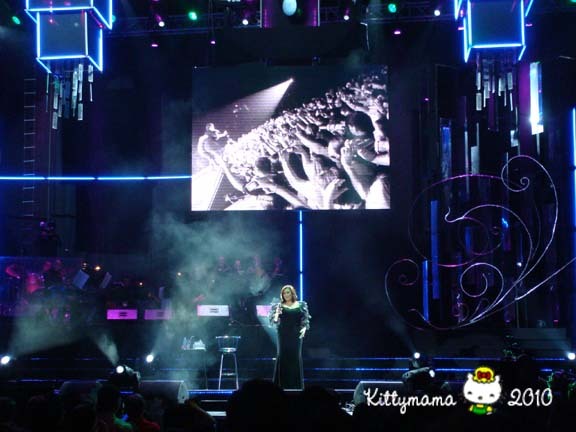 Then too, another revelation of the night was Sarah Geronimo, touted as the next generation’s Sharon Cuneta, who impressed the audience in their duet of “Tell Me” and “Bukas Na Lang Kita Mamahalin.” When Ms. Cuneta ended the show with her encore piece, “Sanaý Wala Nang Wakas,” we were loath to leave our seats and instead made a beeline to the front, where she gamely shook hands with her grateful fans. It was a great show, and A and I throughly enjoyed every minute of it. Ms. Cuneta’s voice was whole and outstanding and in perfect form the entire night, in stark contrast to her 2008 concert when she was visibly sick and yet continued to perform her heart out for her audience.It was exciting just to be in the same room with her, never mind that there were thousands of others with us. After all these years, she still has the ability to make things personal and to connect with each person with ease and sincerity that you never remember that she is a star. That, I think, is what really sets her apart from her peers. Aside from the good friends I met in the audience (Noel F- our friend since high school, back when he and A were still little squirts, and Eloisa M, who I like to think as my soul sister- we like so many of the same things ), I knew I was also ending the night with more good friends. Janus and Ernest are my friends and classmates from med school, and our reunions, while shortlived and rare, happen every time Sharon has a concert. (I have to mention that Janus was and still is the smartest in our batch and Ernest was and still is the most artistic. Both are practicing doctors and I am very proud to be their friend. ) If only for that reason, I want Sharon to perform in concerts as often as possible. Well, that night, over Dairy Queen Blizzards, we relived the show and fawned over Sharon (we like to call her by her first name, as we pretend we are close to her, haha), critiqued some parts (the parts where she was not on stage) and discussed plans for our next meet-up, hopefully very, very soon. We will always be Sharon fans, kahit maputi na ang buhok namin. 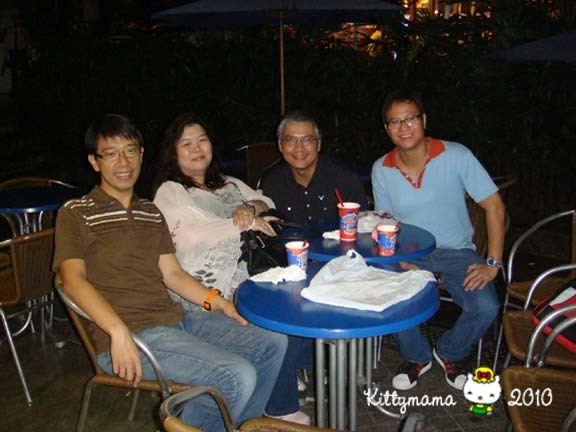 "The UP Sharon's Fan Club"
Sharon + DQ + friends + perfect combination! And then I went home and drifted to perfect sleep. I guess when you start the night with a star- Sharon Cuneta- shining brightly over you, end the night with dear friends, and come home with your bestest friend, then the world, even for just one night, is absolutely perfect. Back to back concerts on this year’s Labor Day weekend kept me up till the wee hours of the morning. I didn’t think I was up to it, really, having caught a nasty bug over the week. It couldn’t have come at a worse time as A and I had good tickets for both concerts. The sniffles were irritating, my throat was painful and raw, and the sinus pain that came with these two drove me crazy. As temperatures reached record highs last week, the rains managed to make brief appearances here and there in the city though they were obviously not enough in both duration and volume to dispel the heat. Still, this weekend proved this old momma still has some “magic” left in her aching bones. Even as my creaky knees, throbbing head, and sore throat were just about ready to give out, I danced and jumped and screamed myself hoarse those two nights. (Good thing I had all of Monday, a holiday, to recover.) 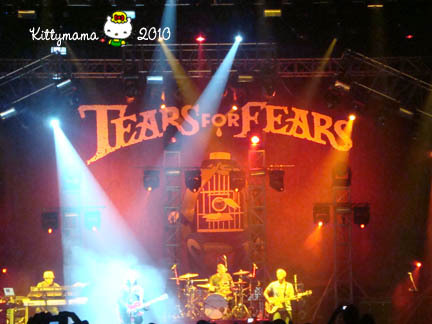 Kelly Clarkson’s “All I Ever Wanted” concert tour was on Saturday night while Sunday night was the Tears for Fears Manila concert. 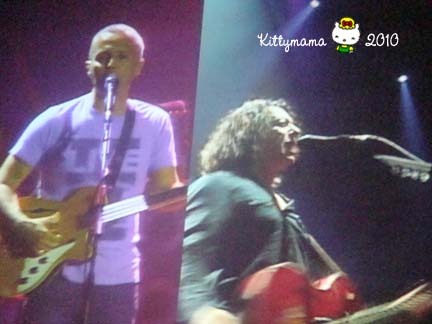 I truly enjoyed both, but coming from a true blue Generation X-er, I have to admit the Tears for Fears concert was more up my alley. 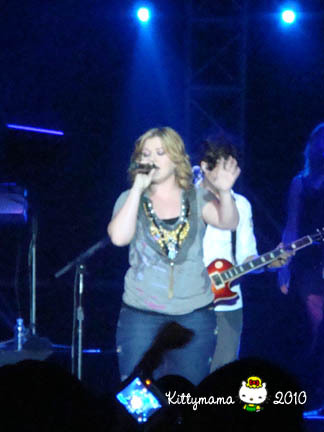 Kelly Clarkson wows the audience with her vocals. 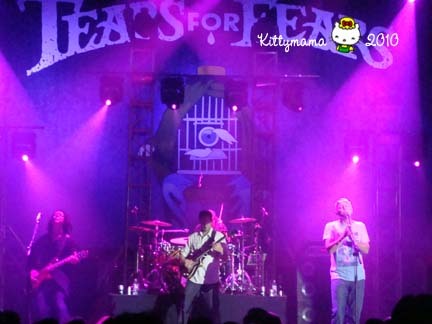 There were so many people that there are reports of another TFF concert in the works soon. Even Sylvanians just got to have fun. I needed a BIG pick-me up yesterday. I’ve been stuck in the house for a few weeks now, unable to bear too much movement and traveling. A, the kids, or the nannies have taken over almost all of my chores. I don’t even do the groceries anymore. As such, I am always in oversized pajamas around the house. My hair has turned into a drab, mousey mop that hangs long and sticky and refuses any sort of management. What I needed was to get out, dress up, breathe normally, and feel free even for just a few hours. You know how when you wish for something, the universe always seems to give you so much more? And then, because he knew I was feeling unkempt and mousey, he offered to bring me to my hair stylist for a quick trim. Haircuts always make me feel happy. I think I scared my stylists, though, when I popped in with the cervical collar. Sheryl and the blow-dry man were so careful with my head yesterday that I hardly felt anything 🙂 My hair is now four inches shorter, but I love it. And just when I was feeling better about myself, an idea struck me. 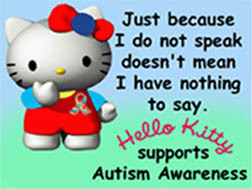 Nothing makes me feel better than kittified things (next to Sylvanian things, heehee) and my boring, white cervical collar definitely needed some pizzazz to match my upbeat mood. I remembered the patches my friend Cynthia had bought for me in HongKong a few months back and with just the magic of a hot iron, I turned my cervical collar into a thing of Kitty beauty. Now, what could be better than that? So, here I am, ready to face the world with a smile again. I was cleaning up files this morning, organizing them in folders, deleting some, transferring the more important ones to my laptop, and saving the rest in CDs. The PC has been boggy of late; sometimes, it slows down considerably while making scary groaning and screeching sounds. Fearing that my files may be swallowed in the black hole of oblivion, I thought it best time to retrieve them before the inevitable crash comes. 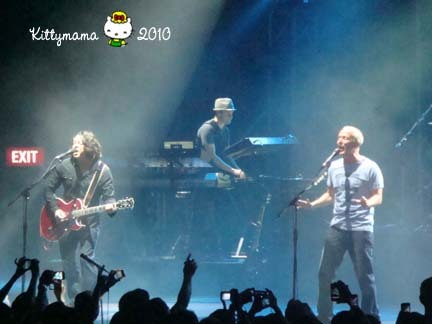 I realized, while moving my digital album files, that I’ve accumulated a lot of concert pictures. I haven’t been as conscientious in keeping this online journal updated with the events of my life, thus, the backlog in this weblog (heehee- sorry!). 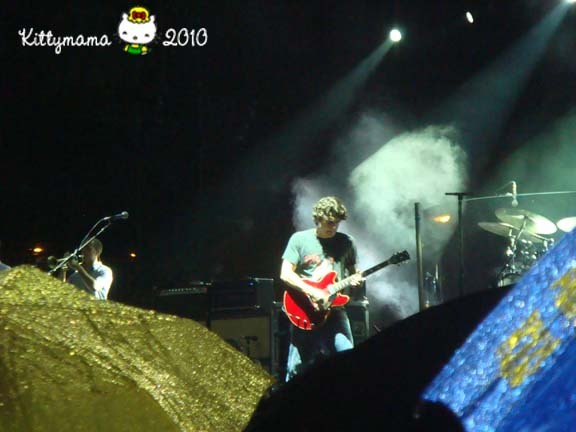 As such, I’ve chosen a few of the more memorable concerts I’ve been to in the last few months and selected some of the nicer pictures to put up and share with you. and “Peter Cetera Live in Manila,” featuring the former lead of the popular band Chicago and the voice behind some of the eighties’ most enduring love songs. Peter Cetera wowed us with solid vocals that have not changed the least bit through the years. Who would believe that this man is past sixty? And who would believe that this man learned to sing through a wired jaw? He is absolutely fantastic even today! In March, Ms. Natalie Cole paid a visit to Manila. Her voice was sultry and warm, her pitch was flawless, and her poise perfect. She was also adamantly opposed to any unauthorized video recording of her performance and had to berate a few members of the audience for continuing to record, even after her early reminders not to do so. 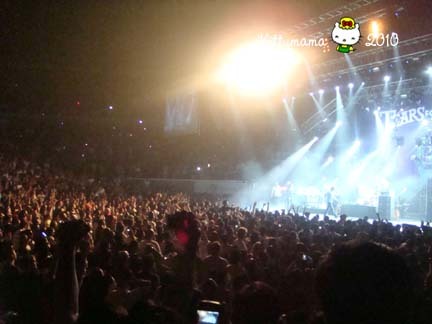 Later that month, John Legend filled the Araneta Coliseum to the rafters, one of the few foreign acts that did so in the early dismal months of 2009. Just two weeks ago, American Idol’s sensations David Archuleta and David Cook performed in a sold-out concert at the SM Mall of Asia. We had VIP tickets, but we learned to our dismay that VIP in this case meant squat. There were simply too many people crammed in a really flat venue. It was hot and humid, unaccustomed as we were (or as I was) to the hot salty sea air that blew only sporadically. I took as many shots as I could but I ended up getting more pictures of people’s heads or behinds as they jumped or climbed on plastic seats to get a better view. 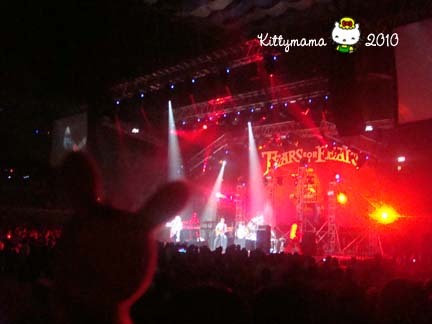 Even Kitty, who sported a specially-made I♥David Archuleta pin, was dead tired before concert’s end. 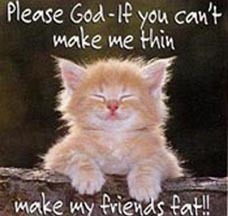 By the way, you won’t see any David Cook pictures because I, ehrm, rather, Kitty is a diehard Archie girl. Last week was pretty hectic; three concerts in one week (Alicia Keys on Tuesday, Sharon Cuneta on Friday, and Tony Hadley on Saturday) and my body felt as if it were being punished already. By Sunday, all I wanted to do was sleep and for the first time in days, my body resisted the call of mommy duty. “Mom, I need something,” Alex would holler. I’d drool in response. Alphonse would tug at my hand and give me a PECS card; I’d stare at the card blankly and wonder what the heck those little pictures meant. My mind was a blank. And A would ask me, “Do we need anything from the grocery, honey?” and I’d try to scribble a list. I think I gave him some funny chicken scrawls and squiggles on a piece of paper. A, always patient, did the groceries himself and let me just sleep in. Whoa, I think I’m getting a little too old for nightlife, heehee. Still, I had such fun over the weekend. A was my concert partner, as usual (he has much more stamina for these things than me, I am constantly amazed at his endurance). I love my husband and I can’t say it enough. When I think about what I made him do over the weekend, I cringe in mock embarrassment, but I am all the more grateful that my life is blessed by this man’s love. Ms. Cuneta’s concert, Megathirty, on Crazy 8 night was very well attended (my review will come out soon) and I’ve never ever been disappointed in any of her shows (I’ve never missed one). Her voice is in the best condition it has ever been in recent years. 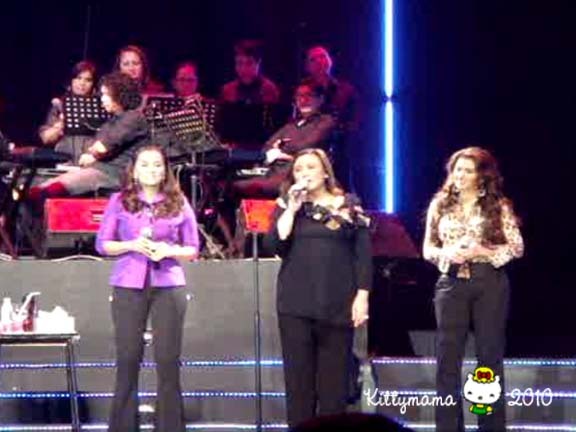 Her special numbers with guests Gary Valenciano and Martin Nievera were truly awe-inspiring. It made my heart swell with pride that these were homegrown talents who could stand tall with the rest of the world. Then too, it happens in the most unexpected of places but that night, I was suddenly reunited with two old medical school classmates I haven’t seen in years. One is a well-known hepatologist (he did his residency at Yale University, completed a three-year fellowship in gastroenterology at the Cleveland Clinic Foundation, and obtained his Master of Public Health at Johns Hopkins University – whew! that was a mouthful!) and the other is a physician who loyally serves his hometown of Tarlac and is such a talented artist that I think he’ll soon be leaving behind medicine to go into full-time graphic novel writing and drawing. I couldn’t seem to hug them enough when I saw them. In the excitement, I forgot to take our pictures and I rued it immediately. Drat! 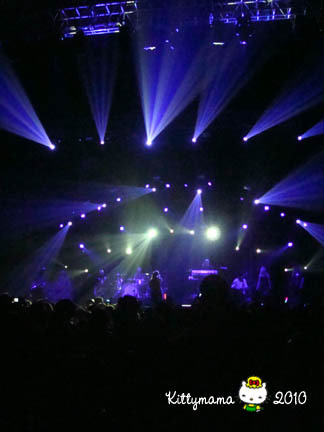 Mr. Hadley’s concert made up for in sheer fun what it lacked in attendance (the venue was roughly 60% full). 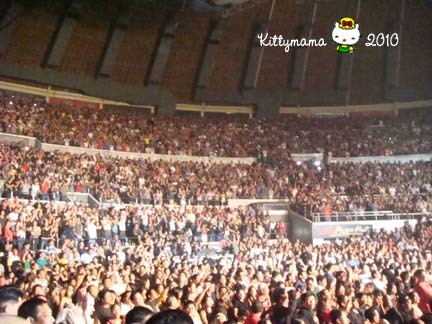 Both concerts were held at the same venue (Araneta Coliseum) so I was able to compare the volume of crowds. What was initially a disappointing sight turned out into a blessing- we danced and jumped and hustled, and we didn’t feel like we were sardines trapped in a can. Tony Hadley still has the voice that catapulted Spanda Ballet into the ‘80s icon it was, and despite the rather poor attendance, he gave us a show to remember. It’s half past one in the morning, Manila time. The whole family’s sleeping soundly, nestled comfortably in their beds. 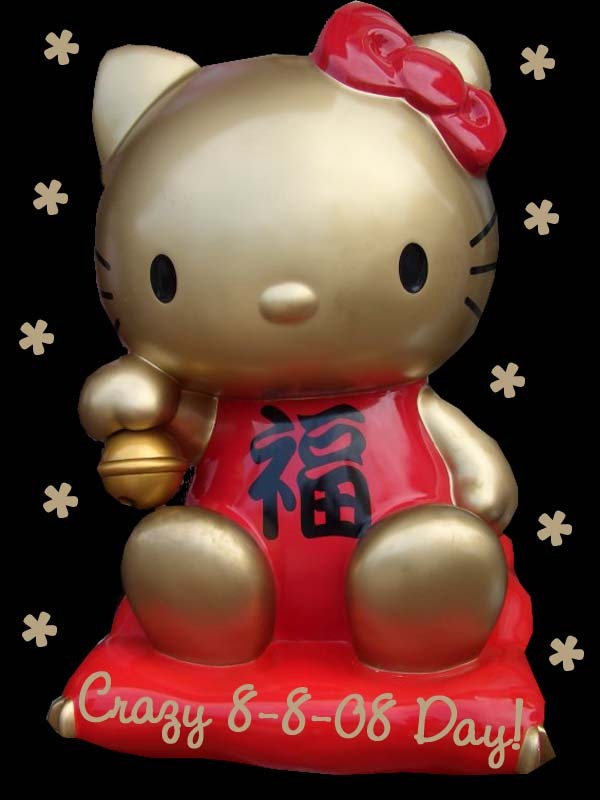 I am the last one up, as I anxiously await the online Crazy 8 Sales that are about to start in my Kitty network. It certainly helps that I am not the least bit sleepy. The truth is, I’ve been running on less than four hours of sleep a day for the last three nights and I am surprised that I have not turned the least bit batty! I think I can say outright that I lay the responsibility for my insomnia to the Alicia Keys concert I attended last Tuesday night at SMX, Mall of Asia. I still have a big hang-over from all the partying that went on that night. If the Daughtry concert rocked my world, this one literally blew me out of my socks! I wasn’t expecting much really. For one, the concert started really, really late, way past the announced 8 pm. Ms. Keys was onstage just a little before ten, and while the front acts (Luke Mijares and Duncan Ramos- they were good too) tried their best to tied the crowd over, the wait was already too long. Imagine the sacrifice and effort it took to get there, only to be asked to wait again, and I was almost ready to call it quits that night. From my part of the city to the Mall of Asia, what should have been a leisurely 30 to 45 minute drive turned out to be frenzied Speed Racer driving at rush hour.